Google says: All your O are belong to us. 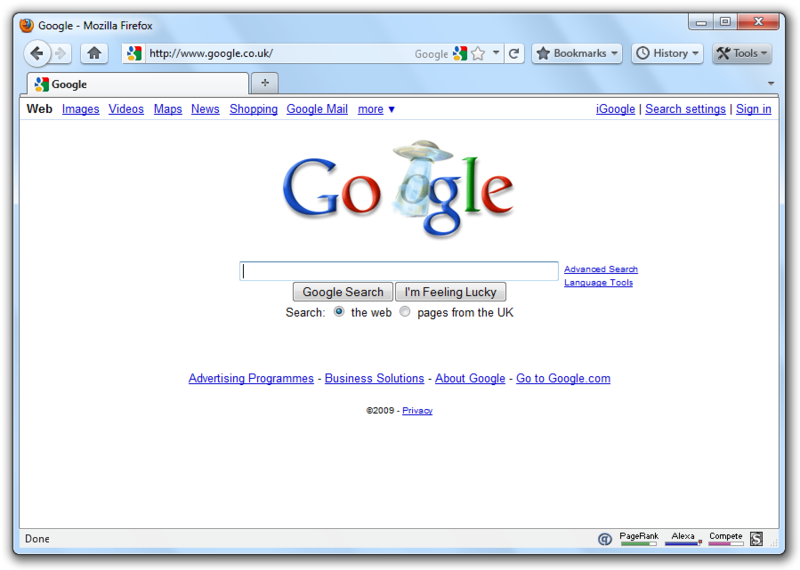 Google normally changes its logo on the Google.com homepage to mark important events. Today, it mysteriously changed its homepage logo to a UFO with a link to the search terms "unexplained phenomenon" leaving many wondering what event the doodle is intended to represent. Does Google believe in Flying Saucers? Or does Google wants to convey that its dominance extend beyond this planet? Some think that the flying saucer maybe symbolizing US Air Power. What message Google wants to transmit can be anybody’s guess. Maybe, it’s a message of peace to humanity. 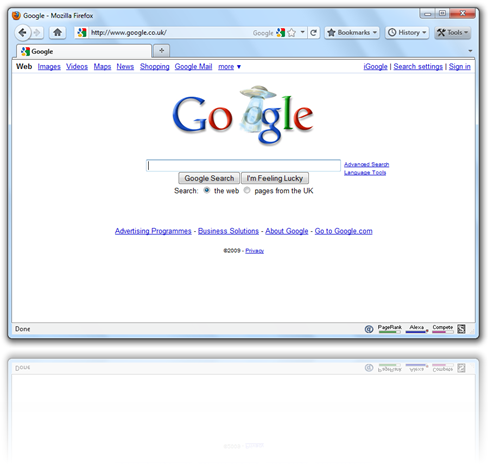 In the logo seen in the screenshot below, ‘GOOGLE’ which is the symbol of global community, has been disintegrated by alien forces through a beam emitted from UFO. When you click on the doodle, you get the “unexplained phenomenon” search results page. Google Germany and Google Russia also have their versions of the doodle called “Rätselhaftes Phänomen“ and “необъяснимые явления“ which almost translates to “unexplained phenomenon”. US will soon get the “unexplained phenomenon” doodle on its homepage too. Google has also tweeted: 1.12.12 25.15.21.18 15 1.18.5 2.5.12.15.14.7 20.15 21.19. which if translated into letters reads: “All your O are belong to us”. The URL to doodle image is https://www.google.com/logos/go_gle.gif, which also suggests that there’s a missing "O". This Doodle may or may not have any meaning. Maybe it is just a joke and someone at Google is laughing at all of us? Will some one clarify the “unexplained phenomenon” and what Google actually wants of all this? Yes, I can smell it too. The UFO thing is about to be hot and hotter still. Why? Because it is scary! Many people are very scared of aliens whatever threat they pose to our planet. Is it real? Who cares! Is UsamaBinLadden real? Were WMD in Irak real? They were made to look that way at the moment. Who might want to do such a crazy thing, hmmm? Scaring people the globe over!!! Please leave politics out of postings about technology. For the record, the US Air Force does not target civilians. And the Kunduz strike was on Taliban-captured fuel trucks. The only reason civilians were injured was because the Taliban was using them to unload the fuel. BTW, your misguided anti-Americanism has just lost you a reader. May be something to do with recent space Shuttle launching. After all, we are also Aliens to other planets, isn't it? You are right, they make unreal things look so real, especially when they are scary. In this way they influence the mind of people to attract them. May be making people scared is the best way to have their complete attention. it was only done to attract people, so the more people search through google. it might be a Google's new tactic to attract more customers. EVERYTHING IS FAIR IN LOVE, WAR AND BUSINESS. This phrase is no longer the same! maybe it's so that people like us will talk about it, and therefore, Google will get publicity! I like your Firefox look, what plugins do you use? I just found out that in 2001, there was a flight test in area 51 on September 5th. Maybe that's it?